This article was originally a blog post at Deonandan.com on Aug 30, 2006. This version was published in India Currents Magazine in October, 2008. 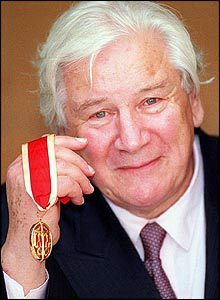 One of my favourite actors was the late Sir Peter Ustinov. Sir Peter was not just a thespian, but an outspoken intellectual, journalist, representative for UNICEF and past President of something called the World Federalist Movement, which was an attempt to create formal global citizenship and thus forestall the possibility of another world war. Ustinov’s observation should be clear and self-evident to most people who have sympathy for the world’s dispossessed hordes, yet sadly we live in a time of simplistic dichomoties, not one of sensitivities or subtleties. Additionally, in this new era of reflexive stupidity, it behooves me to have to declare yet again that acceptance of Ustinov’s axiom is in no way admission of support for terrorists or their causes. If anything, it’s a further disavowment of terrorism, as Sir Peter’s quote lumps the tactic in with the great obscenity of civilization: war. Therein lies the unspoken pathology of the present pro-war set: one may offer rhetoric to the effect that war is bad and needs to be avoided, but a current of militaristic fetishism runs deeply through such declarations, borne out through the constant reassertion of the glories of traditional military trappings: uniforms, ballads, flags, worn out slogans and the like. I believe Ustinov’s quote comes close to revealing the true source of discontentment from which the more virulent of the pro-war crowd suffers. If, as Ustinov correctly observes, terrorism and warfare are two sides of the same coin, how truly thin is the disk of metal that separates them? If one defines terrorism as violent acts deliberately perpetrated upon civilian populations in order to attain political goals (a commonly accepted definition), then traditional warriors certainly qualify. The Nazis were terrorists for establishing death camps and for raining bombs down on London during the Blitz; their goal was political change through the destruction of the innocent. The Allies were also terrorists for flattening Dresden, Hiroshima and Nagasaki, since the killing of civilians was the primary goal of those adventures, as well. Even in situations of what modern spin-doctors call “collateral damage”, wherein civilian deaths are incidental to the destruction of military and industrial targets, the defence is disingenuous, since if civilian deaths are expected, then they are de facto targets and hence are victims of terrorism. This is especially true when the goal of the operation is as much psychological as it is military, as in George Bushs “Shock and Awe” strategem in Iraq. In legal cliche, “intent follows the bullet”. What then is the difference between “warriors” and “terrorists”? I submit that the difference is in the trappings. We of the “civilized” world dress up our “warriors” in uniforms that are fetishized by fashionistas and undersexed young people. We march our beloved soldiers out to the strains of thrilling drumbeats and marching bands. We wave flags that somehow (God only knows how) have attained the status of personages, to the extent that in many armies the only right action after losing one’s flag to the enemy is to kill oneself. All these trappings are frail and feeble and desperately transparent in their role to distract us from the true task of their bearers: to kill other people. One can argue, to varying degrees of success, that the killing is justifiable; but make no mistake, killing is what warriors do. How then did the word “warrior” take on a positive connotation in our culture? In one of the Star Wars movies, Luke Skywalker tells Yoda he is seeking a great warrior, and Yoda wisely responds that wars do not make one great. A warrior is someone who makes war, kills people, destroys property, causes suffering and mayhem. Yet every society seeks to grant such individuals –criminals in any other context– the shimmer of honour. We do this because the alternative is to slide into guilty, self-hating despair. Our warriors kill at our behest, after all. We must innoculate our warriors, and thus ourselves, against self-hatred, lest the ugly truth of our actions overwhelm us. The substance of such innoculation is pomp, rhetoric and pageantry, and even the mysterious, mythical and oft-cited honour that supposedly besets the warrior creed. Terrorists, according to Ustinov, are the warriors of the poor –with the word “warrior” used herein in its true, unglorified meaning. Buth they have no such trappings under which to hide their shame, no societal innoculation, save a dogmatic belief in their cause. It is this thin and artificial veil that separates suicide bombers from B2 bombers. And it is the thinness of this veil that makes many of the hawks of the West uncomfortable: to honestly consider the motivations of terrorists is to compel oneself to honestly consider the motivations of the military actions of one’s own cultures and countries. And for many, that is an unpalatable prospect. To see oneself in the actions of one’s enemy is a painful exercise akin to psychotherapy: only the strong and centred can survive it. To be a “peace-keeper” is an moral and upright calling. To “police” a zone, prevent crime, protect the weak and provide a psychologically buttressing presence are worthy activities for those who seek to make the carrying of assault weapons their main trade. But to make war against the innocent who have not harmed or threatened you, whether traditionally under a flag and wearing drab olive, or asymmetrically while dressed in civilian garb or a vest of explosives, is supremely psychologically and morally transgressive. We will necessarily argue that armed action, while ugly, is nonetheless sometimes necessary. Lets at least have the courage to admit that the killing of civilians, either by targeted terrorism or expected collateral damage is murder, and stop hiding behind the unconvincing veneer of honour, religion and tradition.